Over the weekend I read a book than Nathan loaned me. It is called Experiential Storytelling: (Re)Discovering Narrative to Communicate God's Message. You can click on the link above to check out the book at Zondervan Publishing. Mark Miller, the author, paints a telling picture of the world today and of the churches attempt to comunicate with yesterday's style. Then he challenges the reader to lead people into experiences of the Gospel rather than sermons based on the gospel. The book, published in 2003, recognises a growing need for story based exposition of the Gospel. But, Miller takes it a step further than "telling" the story. He suggests that people - expecially today's youth - learn best through experience. Therefore, creating ways that youth can interact with the story is the best learning strategy. Peppered with quotes on learing and speaking, it is a great resource for any budding preacher, teacher or leader. As I read the final chapter, which focuses on expamples of the theory in practice (I would have liked to see more of these! ), I couldn't help realising that the Adventist Church in Victoria, Australia is doing a pretty good job of it. 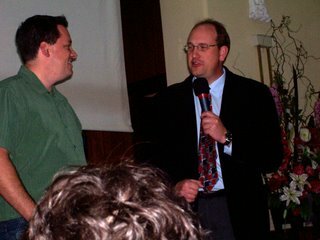 The Road to Bethelehem and Road to Calvary "walk-through" programs are both experiential storytelling experiences. What a great, thought provoking topic. If we were going to go down the whole post-modern track we could say that truth is nothing, truth is everything. What you believe is truth, what I believe is truth, because we make our own realities and truths. So if we construct our own truths - do we need the Bible (an instruction manual of truth)? Post modern thought falls down in the area of acountability. If there is no ultimate truth, then we are not accountable to anyone or anything. I don't believe God is a post modernist - but that is not to say he isn't available to post modernists. If God was a post modernist, the 10 commandments would become open to any interpretation, in fact the whole Bible (even Jesus) would be open - and each one of them aceptable. This doesn't sit well with me. So do we need the Bible to know God? This is how I see it - the Bible is a literary representation and account of the Truth. So by reading it we get to know the Truth. However, the Truth is more than the Bible, it is God. God does not need the Bible to exist, but the Bible exists because of God. It is therefore possible to know God without the Bible (such as Enoch did), but impossible to know the Bible without God. Cyrus and I spent a week together in Adelaide. It was heaps of fun! We did lots of fun stuff together including riding a camel at Monarto Zoo. 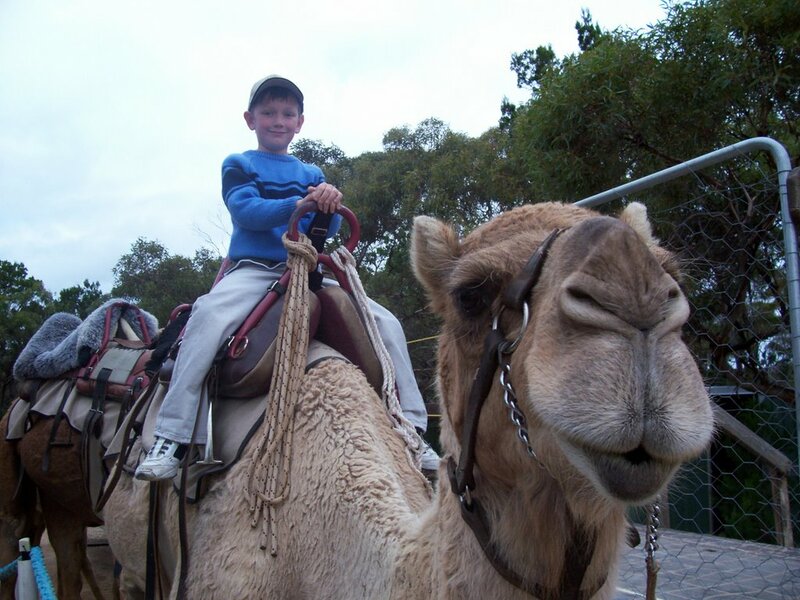 (I got off the camel to take the photo). This camel was kind enough to take us for a bouncy walk around the place. Then he say down(!) and we hopped off. Cyrus and I had a great time in Adelaide with the students at Prescott College! What a fantastic week! Last week was a real spiritual high for me. I spent the week with the students at Prescott College as their Week of Spiritual Emphasis speaker. I was amazed at the level of spiritual awareness, rediness and passion of the students. During Song service they sang! the drama's each day were great. The musical items were evidence of a gifted community. Thank you to all the people who made the week so wonderful! And thanks to the SA Youth Department for looking after the needs of Cyrus and I. We had a great time! The Youth Rally on Sabbath was another highlight. The young people involved in that program put their all into it. I was amazed by the music, the drama and the Sabbath School lesson was great! For those of you who were there - remember to Look to Jesus! I was talking to Mikey, my 6 year old, last night about the word "Prodigy." He hadn't heard it before. I explained that a prodigy is someone who is extremely excellent in a particular area. Like a math prodigy. He decided he was a math prodigy and an english prodigy. He enjoys both fields of study and does well at them, but it pleased me to think that he thought himself exceptional! Then I said, "Mikey, do you think Jesus was a prodigy?" I asked, "What kind of prodigy was Jesus?" His answer amazed me. Later Jenny said she would have said a healing prodigy or a salvation prodigy. But, Mikey got to the core of the matter! Mikey replied without even pausing for breath, "Jesus is a love prodigy." The more I think about it, the more I appreciate the truth of what Mikey revealed. Jesus is true love. He is everything that is pure and honest and glorious and special about love. He loves the deepest. he loves the longest. He loves the most people. Jesus truly is a love prodigy.